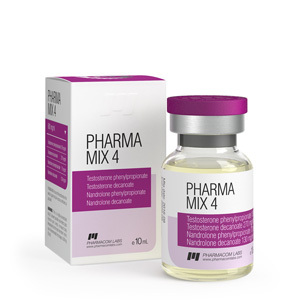 Pharma Mix 4 is a steroid mix, which consists of a combination of such popular and effective in sports esters of Testosterone and Nandrolone, such as: Nandrolone phenylpropionate (75 mg.), Nandrolone decanoate (125 mg.), Testosterone phenylpropionate (150 mg.) And Testosterone decanoate. (250 mg.). This mix is ​​mainly used in sports practice. Its positive properties provide high popularity among athletes, from bodybuilders to weightlifters, aiming for a quick, steady and significant increase in muscle mass, strength and endurance. By the way, about the properties. The basis of Pharma Mix 4, as already noted, is the four most effective esters of Testosterone and Nandrolone. The first one is Nandrolone Phenylpropionate. This is a steroid with the highest anabolic and moderate androgenic activity (respectively 150% and 30% of testosterone), which is valid for 2-3 full days. On the course, he exhibits the following qualities and effects: increases muscle mass, increases strength, strengthens the immune system and ligaments, increases bone strength, and so on. The second is Testosterone phenylpropionate (the period of activity before half-life is 5 days, the full period of activity is 15 days). This steroid, which is the basis of PharmaMix-4, is in turn endowed with 100% anabolic and androgenic activity from testosterone. On the course, he helps the athlete to increase muscle mass, strength, libido and has other effects that are useful both in sports and beyond. The third is Nandrolone Decanoate. This is nandrolone ester with an incredibly long duration of activity (up to 15 days from the time of injection), which promotes muscle growth, improves the transport of oxygen in the body, strengthens the immune system and bones. The last broadcast is Testosterone decanoate. When used in sports, it can also increase muscle mass, increase strength and strengthen the athlete’s body (it has a positive effect on the joints due to the accumulation of water, speeds up recovery processes, increases endurance). • Improves oxygen transport in the body. How to take Pharma Mix 4? This steroid preparation is used mainly for gaining muscle mass, increasing strength and strengthening the body (strengthening bones, ligaments, etc.). At the same time, it can be taken both in solo (it is quite effective in solo, since it consists of 4 most effective steroids in itself) and in combination with other drugs to achieve even more significant results. If we talk specifically about how to take Pharma Mix 4, then first of all it is worth saying that athletes usually use it at a dosage of about 600 mg. 15 days from the time of injection). This, as they say reviews, is enough for a significant increase in muscle, strength and other indicators.